Daffodils are often used to symbolise Welsh culture and St. David’s day, so this gorgeous make will be perfect for March 1st! The beautiful yellow colour on this card will be sure to make any day a little brighter! 1.Take one of your Dovecraft 6x6 cream card blanks and cut one side off. Next, cut it down to a 14cm square. Layer with Dovecraft Perma Fix tape on to a 14.8cm piece of yellow textured card stock from your First Edition Textured Card Stock paper pad. 2. Glue your layered sheets on to your second, Dovecraft cream 6x6 card blank. 3. Die cut the largest die within the First Edition Nesting Scalloped Circle Dies, on to a sheet of red card within your First Edition Textured Card Stock paper pad. Adhere this to the centre of your card blank, toward the top, to allow room for a sentiment at the bottom of your design. 4. 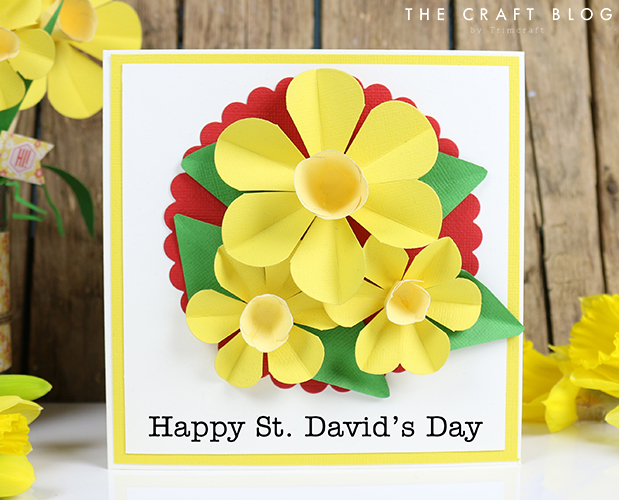 To make the daffodils, die cut 1 of the second largest Nesting Blooms dies on to bright yellow and green textured card stock. Then, die cut 2 of the 3rd largest Nesting Blooms dies on to bright yellow card and once on to pale yellow card. Finally, Die cut 2 of the 4th largest on to pale yellow card. 5. Score a line across each of the bright yellow flower die cuts, from the centre of each curved edge. 6. Cut a line along each side of the petals on the bright yellow die cuts, towards the middle, ensuring to not cut all the way to keep the petals secure. 7. Bend and fold along each score line. This will create the base of the 3 flowers. 8. To make the trumpet part of the flowers, cut in between each petal on the 3 pale yellow flower die cut. Push the sides up and curve around a pencil. 9. Glue the sides together. TIP: use some of the Dovecraft pegs to hold the petals in shape whilst drying. 10. Once dry, glue each trumpet to the base of each daffodil flower base. 11. To make the leaves, cut the green Nesting Bloom die cut into triangles. Cut a curved line on the end point on each triangle. Once done, fold each triangle in half to add dimension. 12. Adhere your leaves with Dovecraft Perma Fix tape to the centre of your scalloped circle die cut. Layer your daffodils on top. 13. Use the Simply Creative Alphabet Stamps to create your ‘Happy St. David’s Day’ sentiment at the bottom of your card. Your friends will be so chuffed with such a pretty card on St. David’s day. Alternatively, you could create a home décor piece following the same steps shown above but instead, attaching the daffodils to wooden skewers. Decorate your pot with a sunny paper design and cut out leaf shapes out of green card to add a realistic effect! Perfect for celebrating St. David’s day or introducing some springtime colour in to your home, this tutorial is a wonderful project to create on a cosy afternoon in. We would love to see your St. Davids creations so don’t forget to upload them to the inspiration area on the blog and to #trimcraft when sharing on social media. You've made this seem very easy. Thankyou for the tutorial I'm going to try this today but with a different flower die as I don't have this one but hopefully it will turn out OK lol.